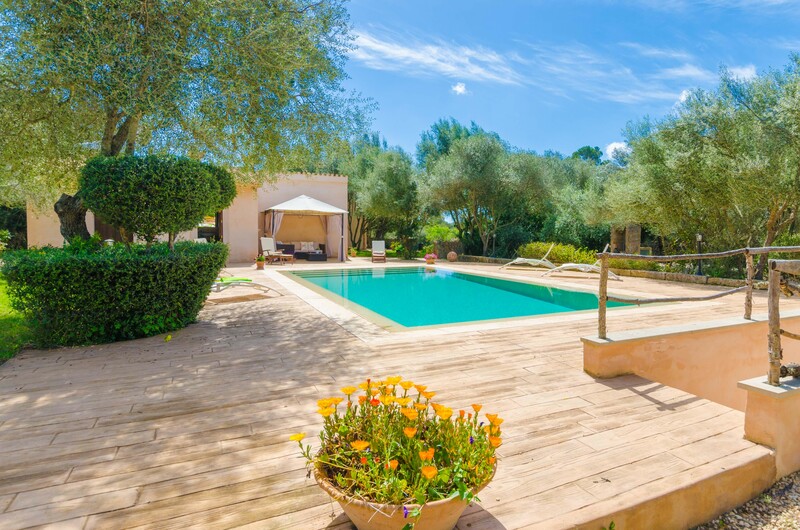 This wonderful house features a 9.5 m x 4.5 m chlorine pool with a depth ranging from 0.8 m to 2 m, surrounded by a terrace with sun loungers. 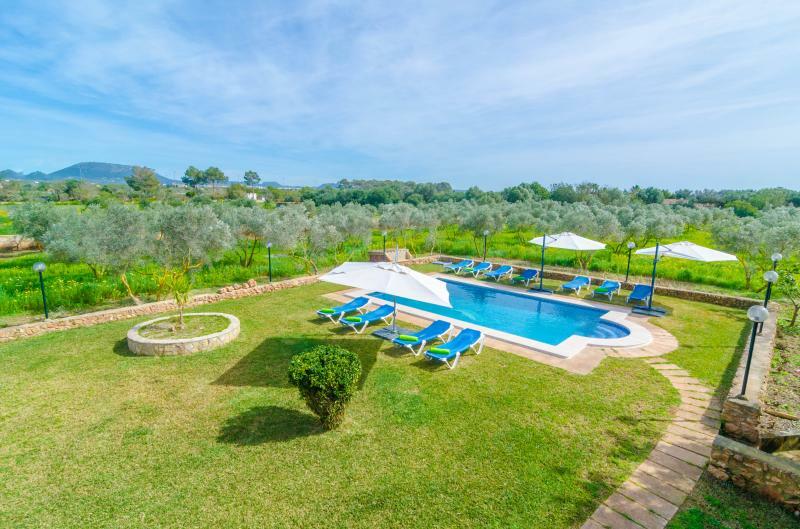 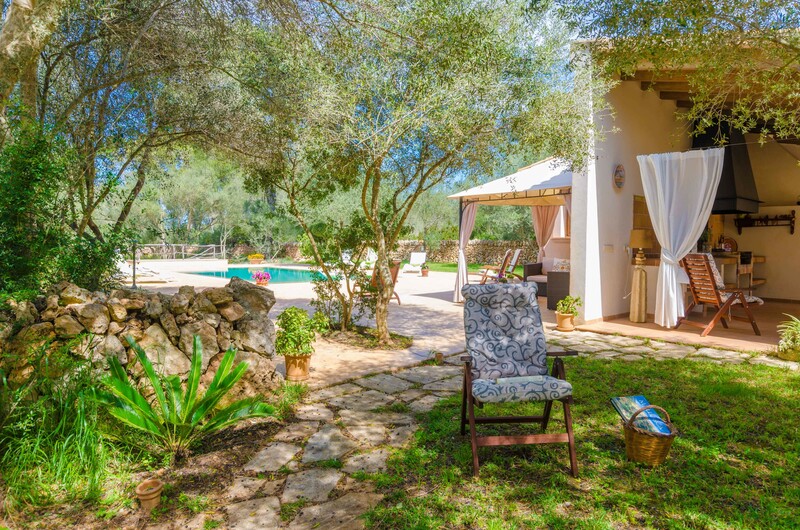 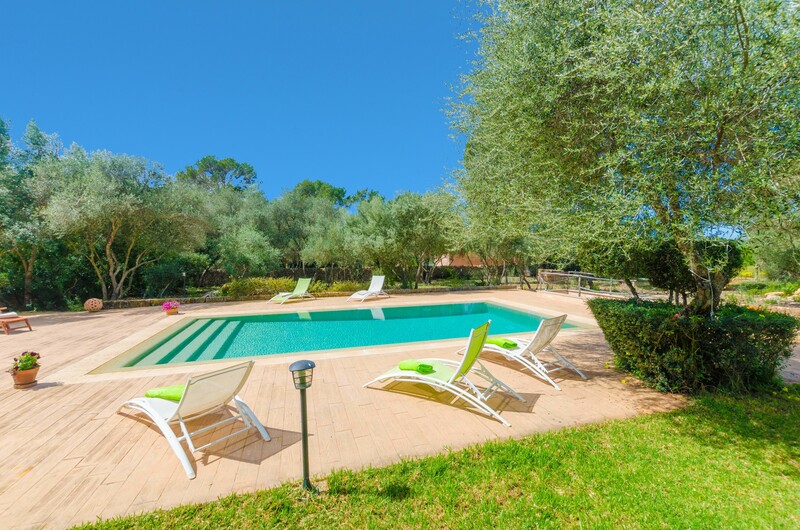 At midday, you can rest on the sofa by the pool, protected by a sunshade. 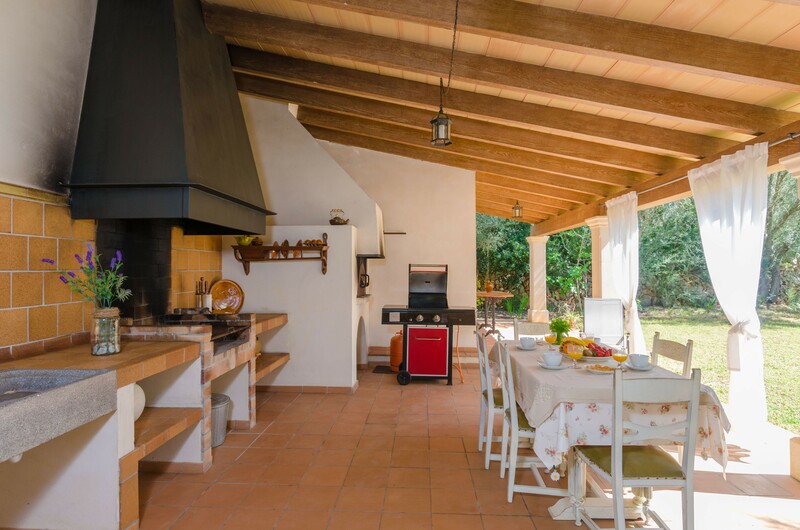 On the nicely furnished porch you can finish off the day with a tasty barbecue. 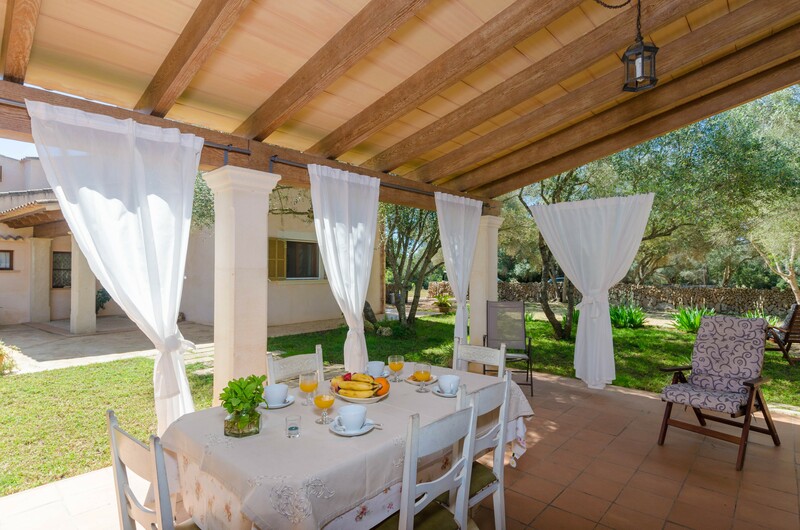 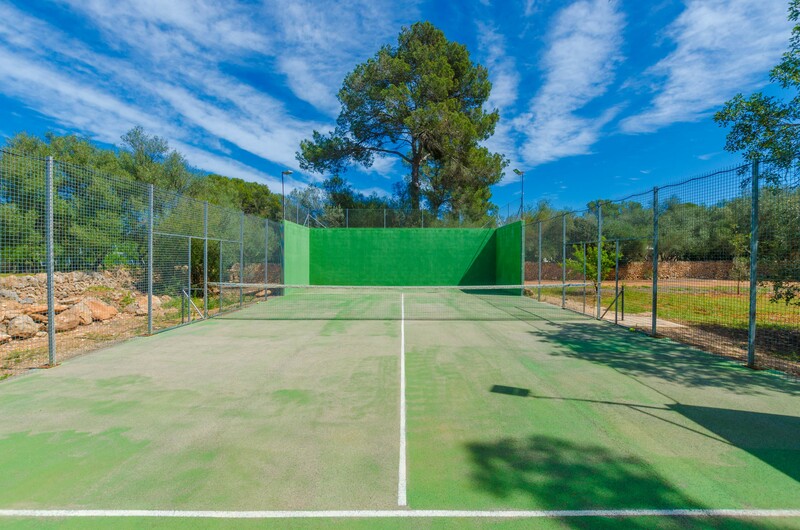 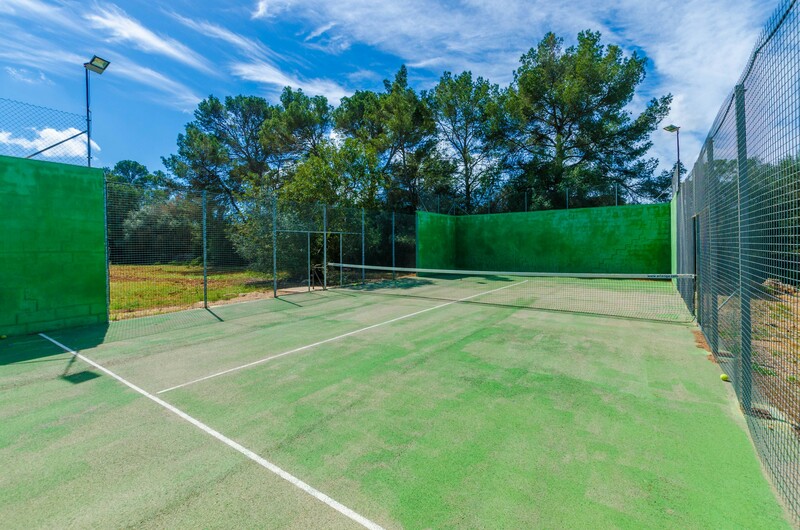 The most distinguishing detail of this villa is the private paddle court with racquets and balls. 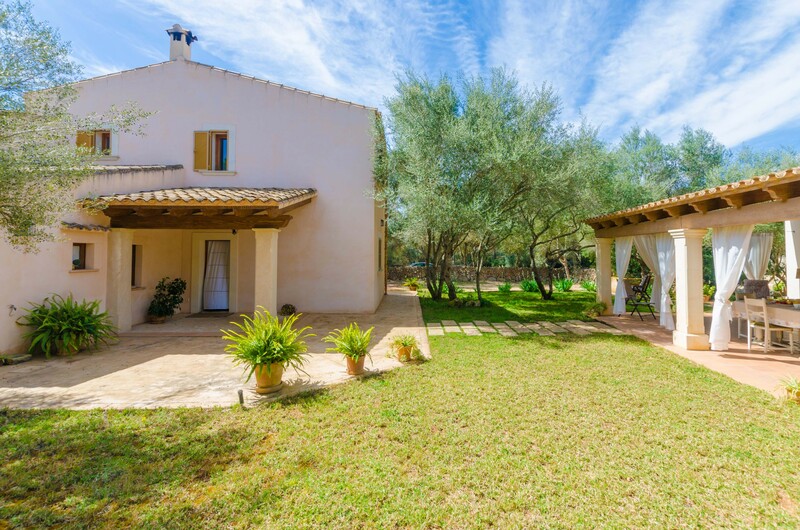 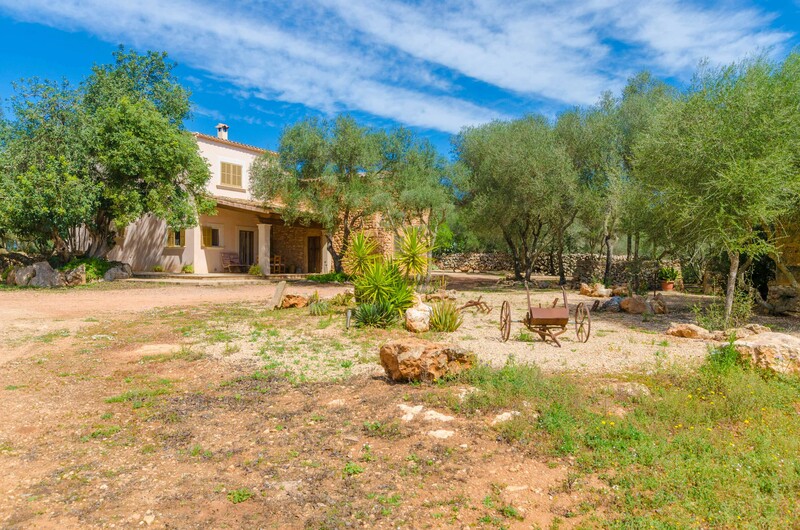 This distinctive property has no direct neighbours and is completely private. 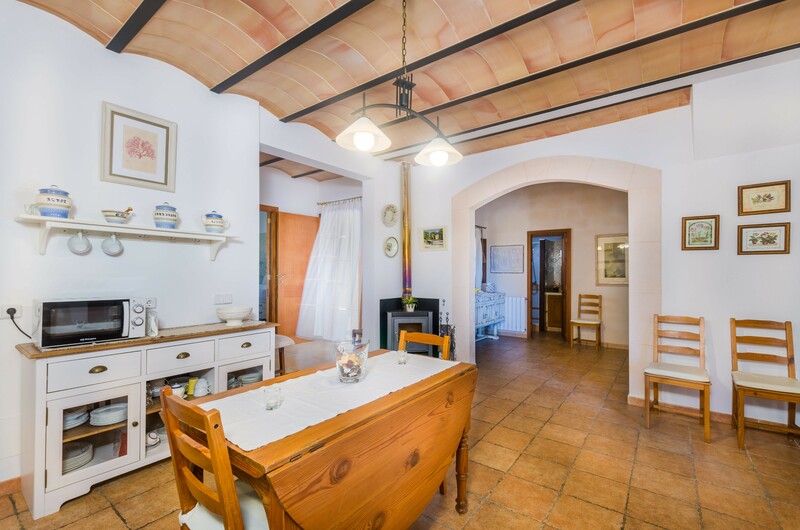 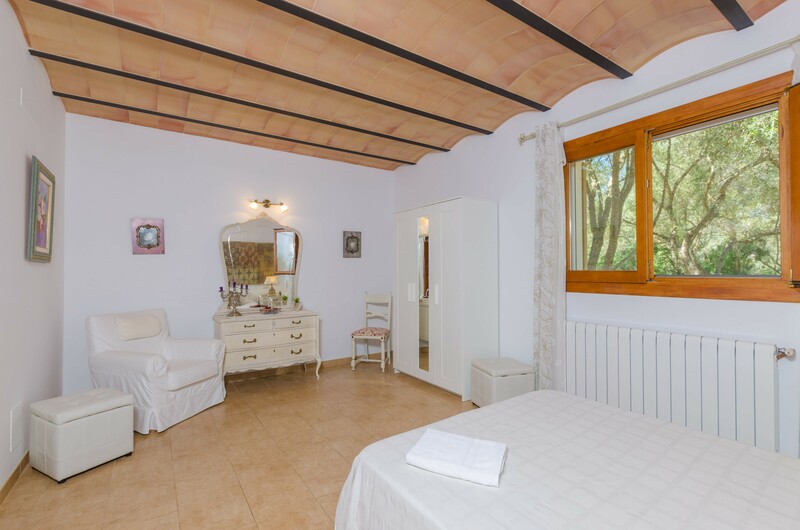 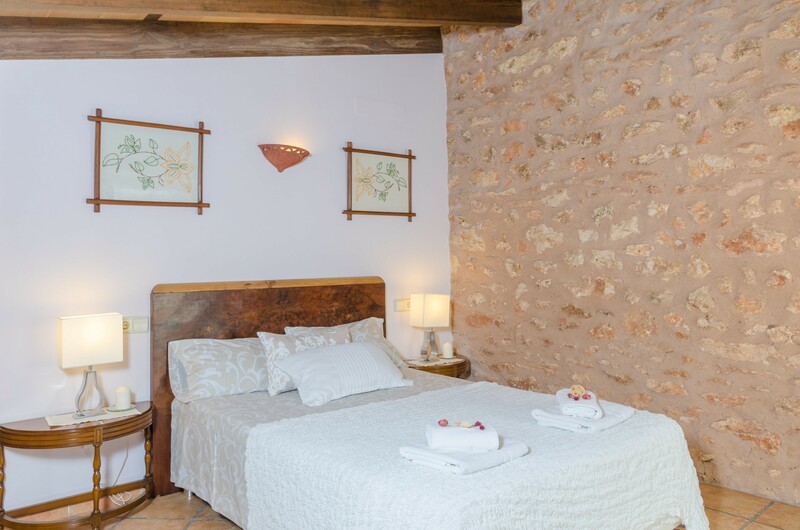 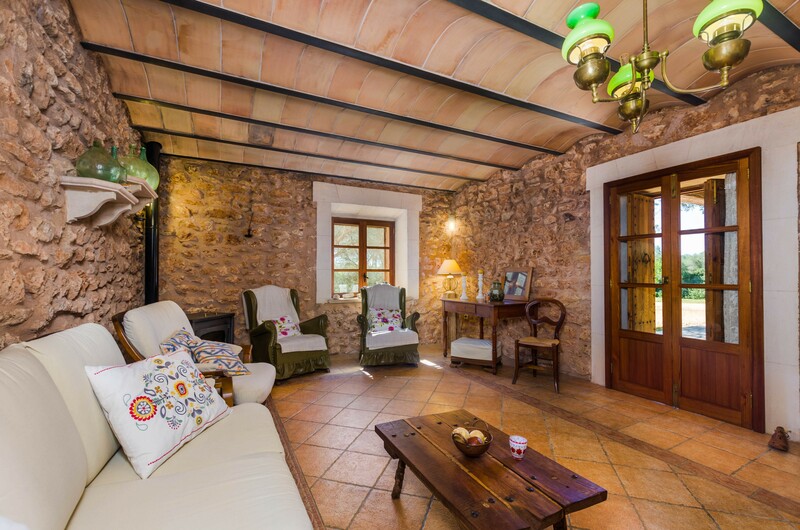 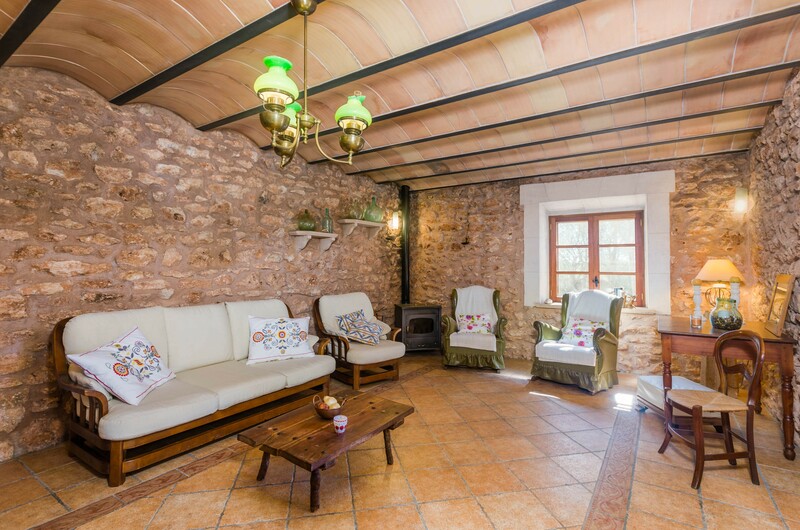 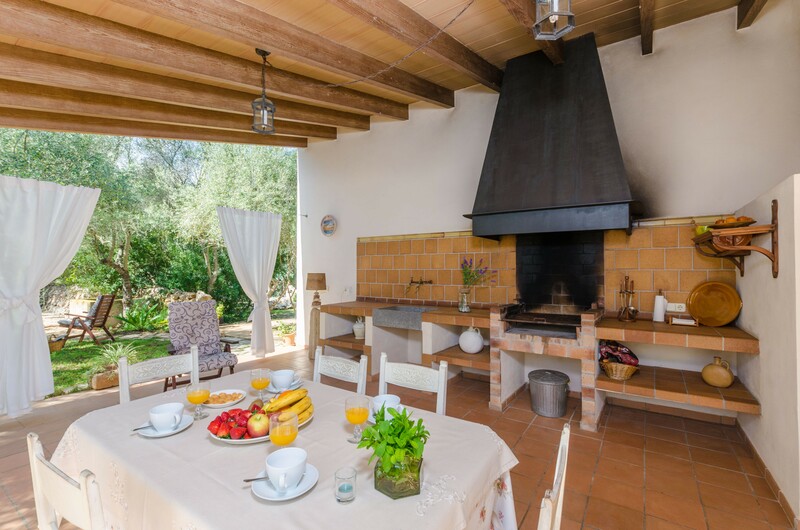 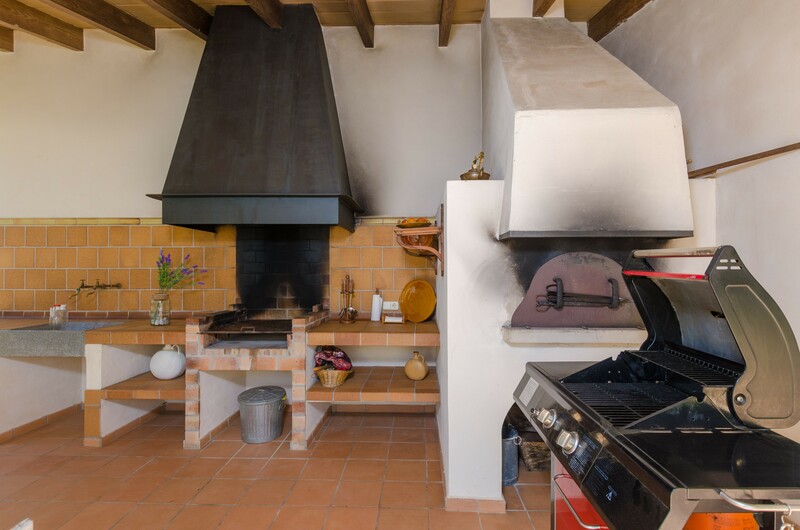 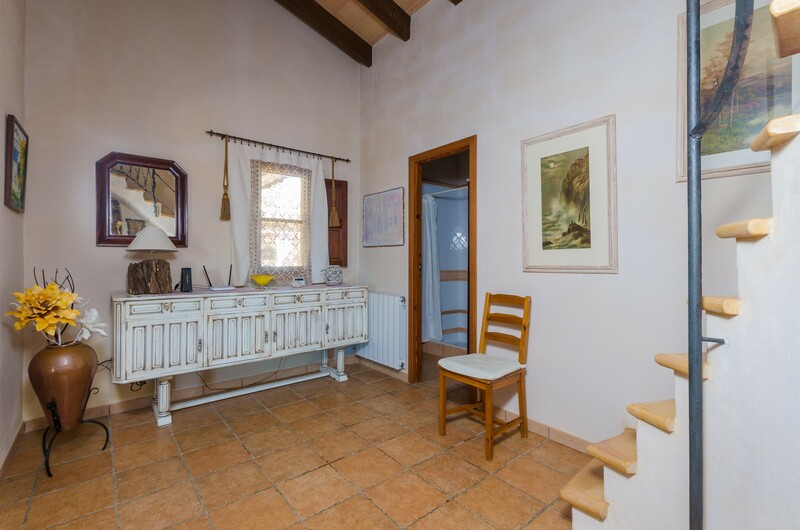 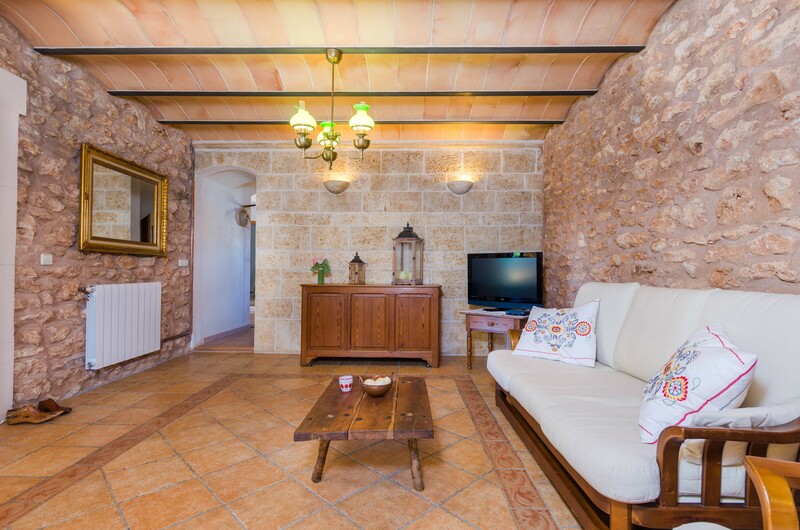 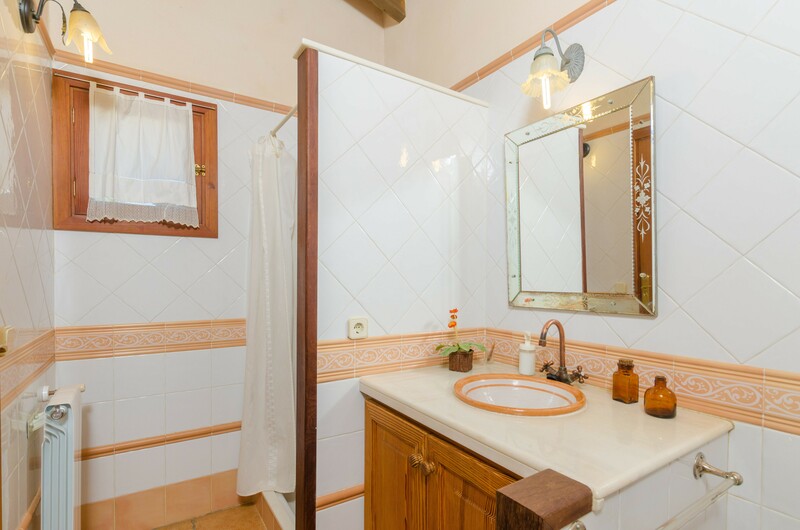 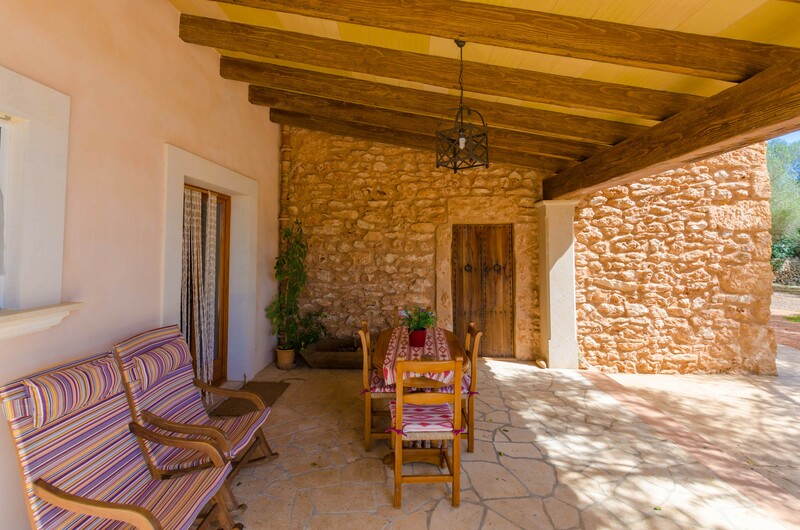 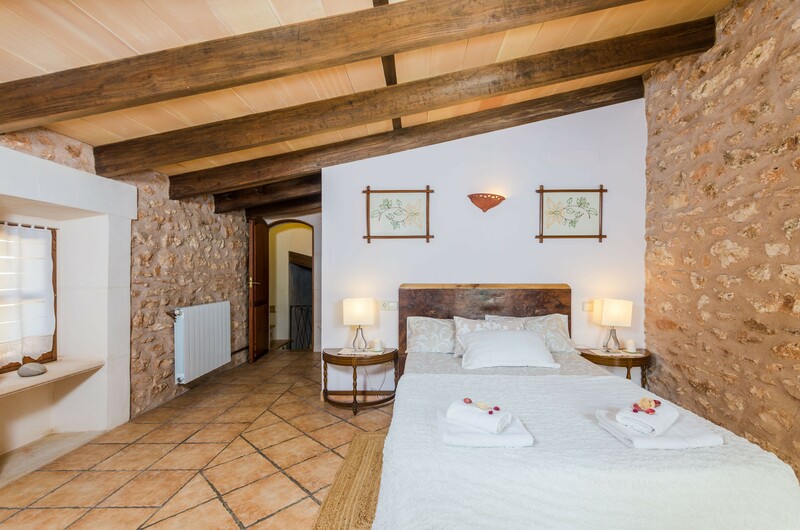 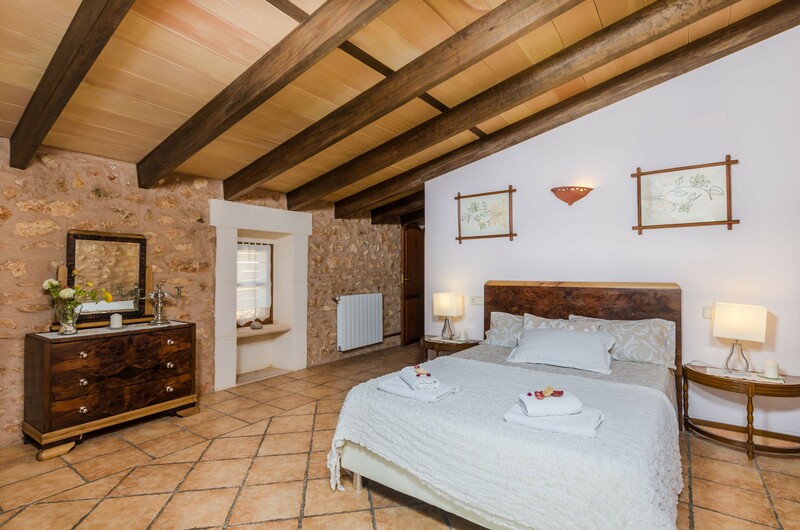 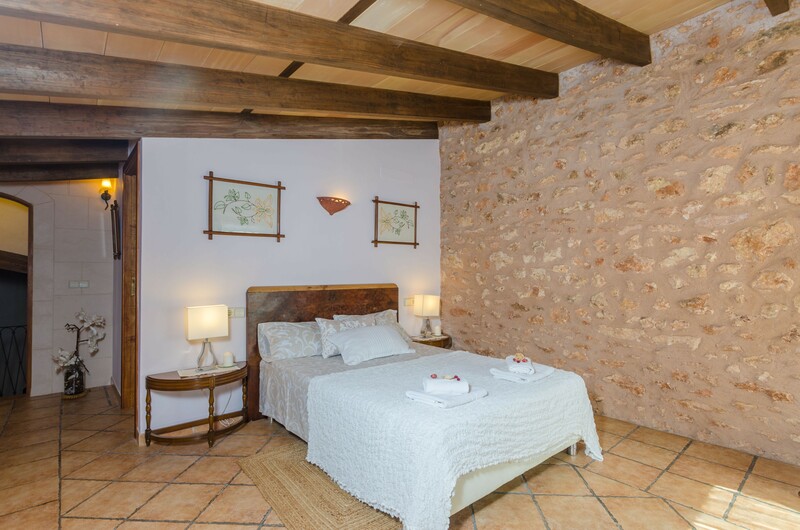 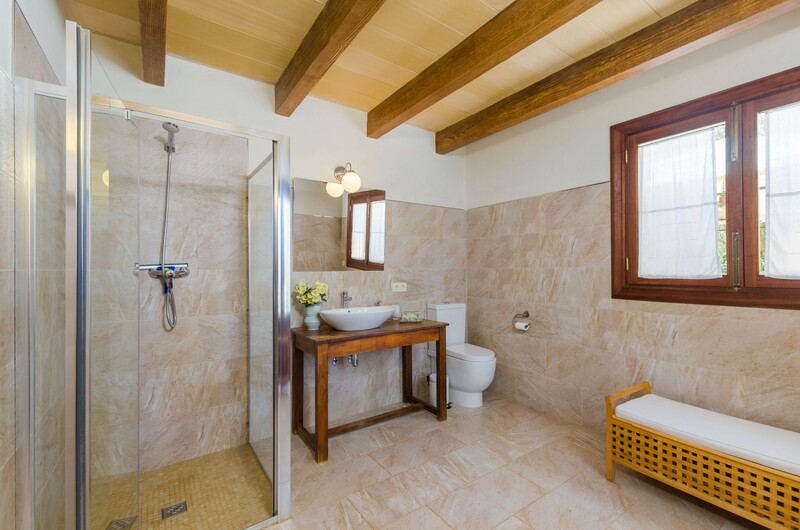 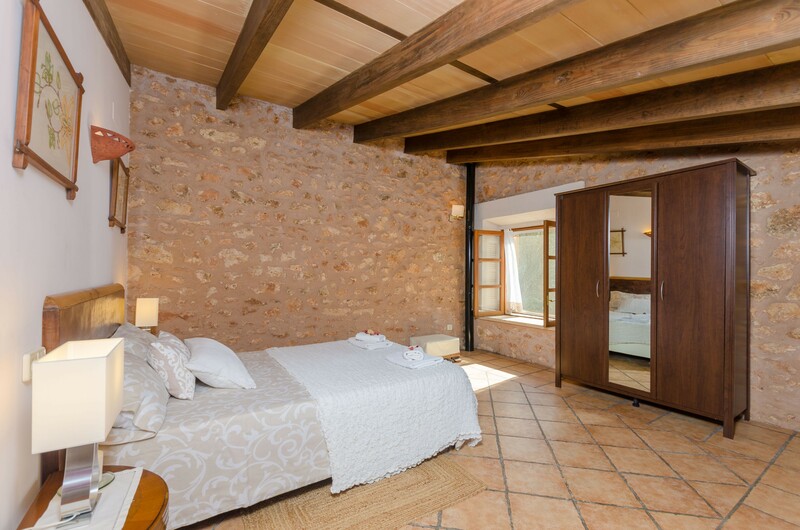 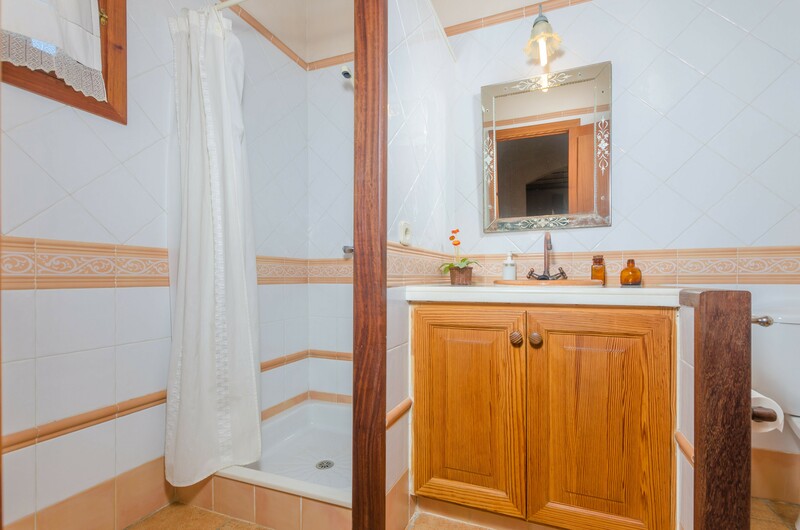 Regarding the interiors, the owner has paid great attention to the details and the furniture is partly restored. 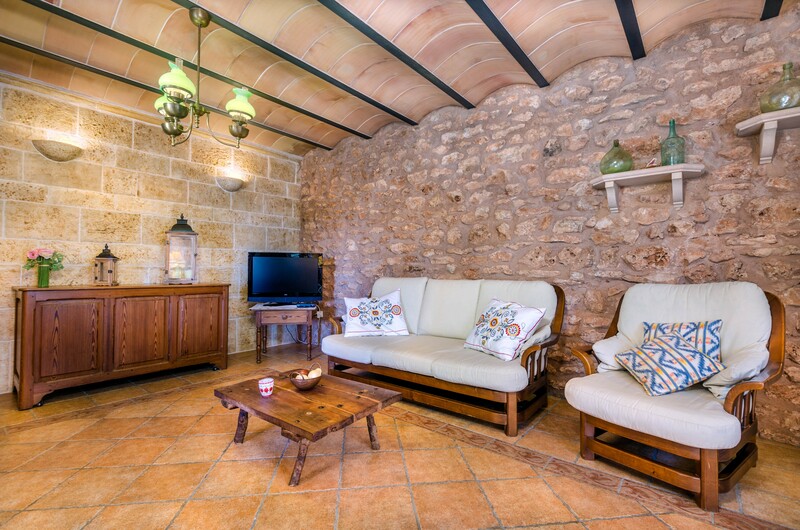 The stone-lined wall of the living room gives a warm atmosphere to the room; where you can watch satellite-TV or rest on the sofa. 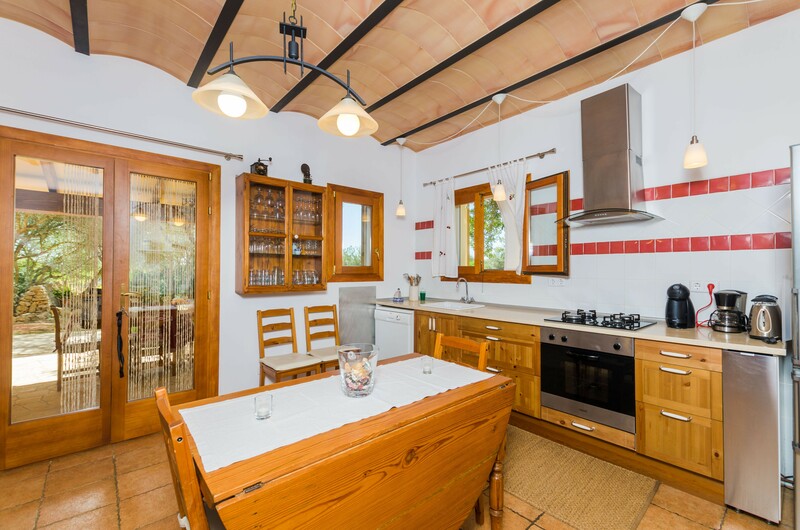 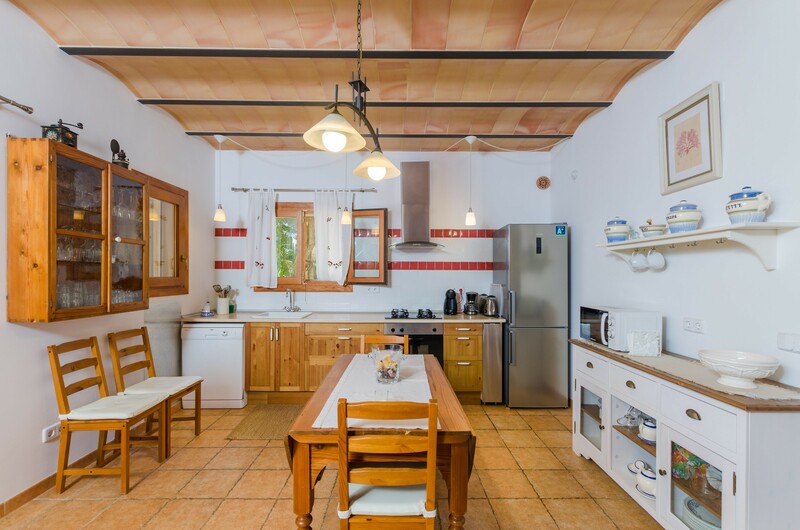 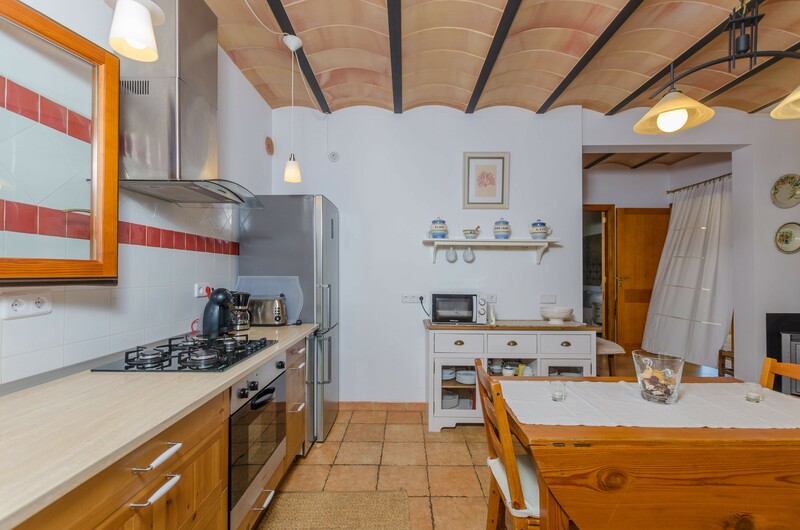 The kitchen with gas stove and dining area is fully equipped. 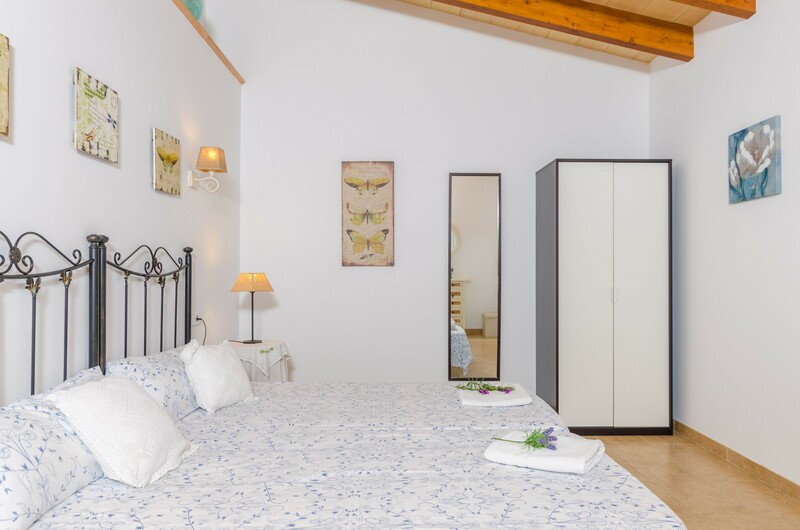 There is a laundry with washing machine, iron and ironing board. 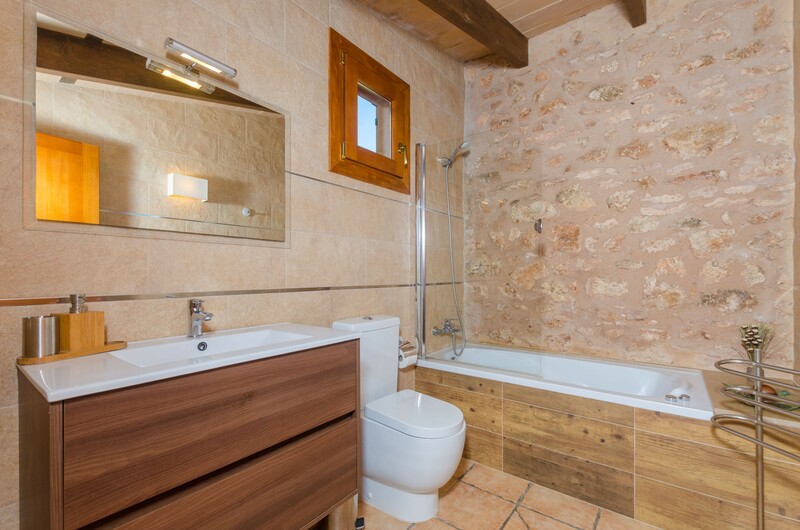 There is one double bedroom on the ground floor with shower bathroom en-suite and space for a cot. 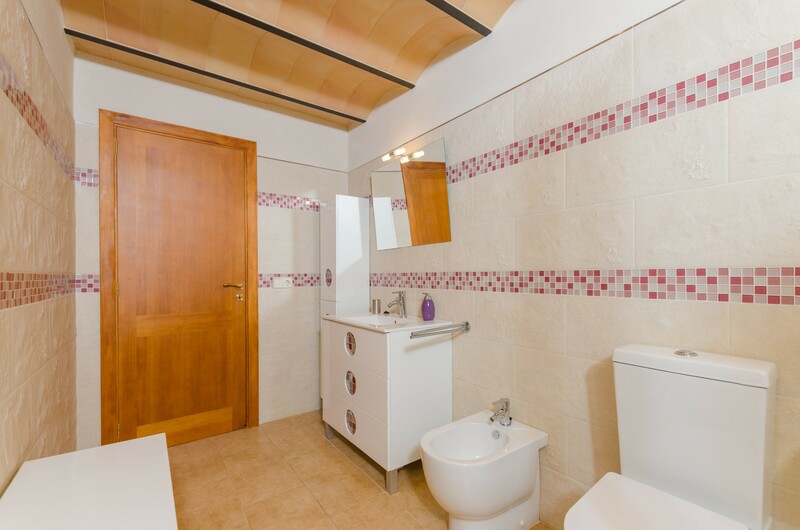 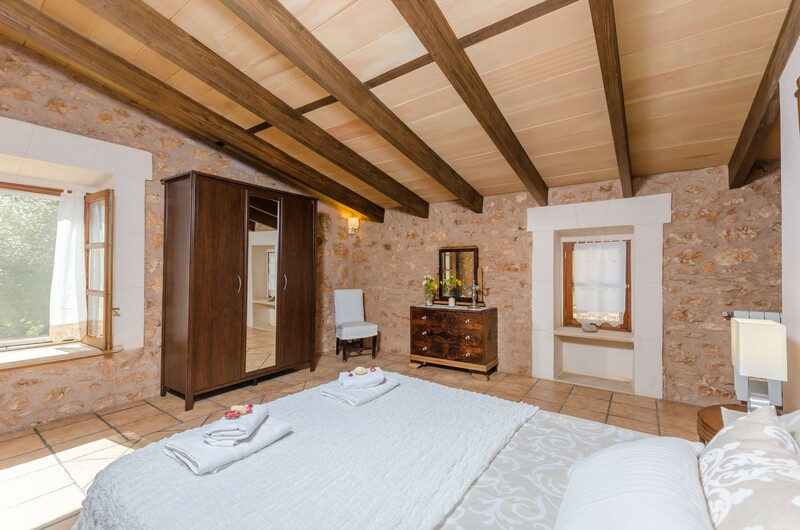 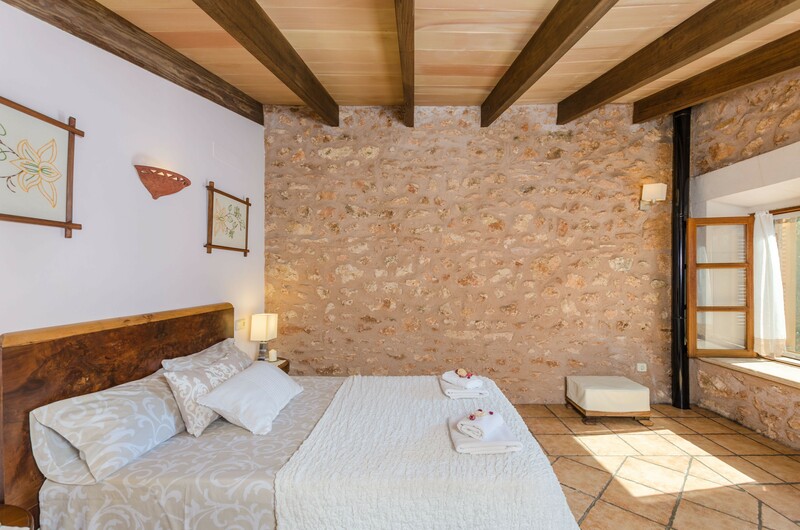 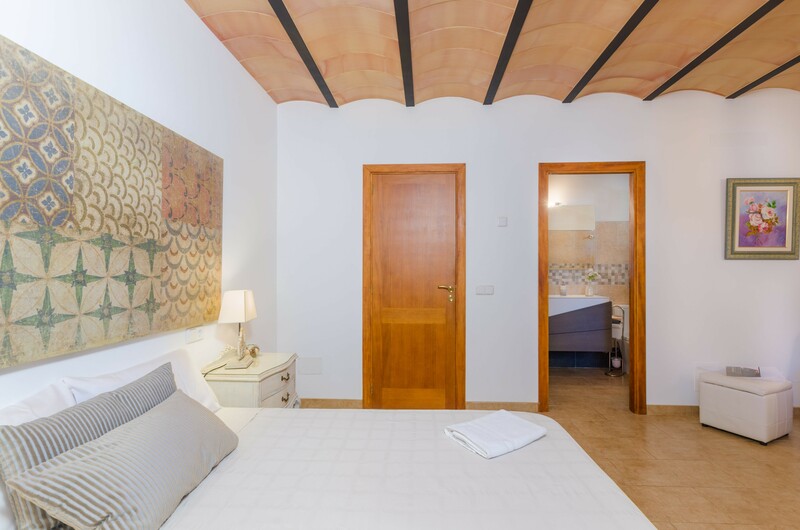 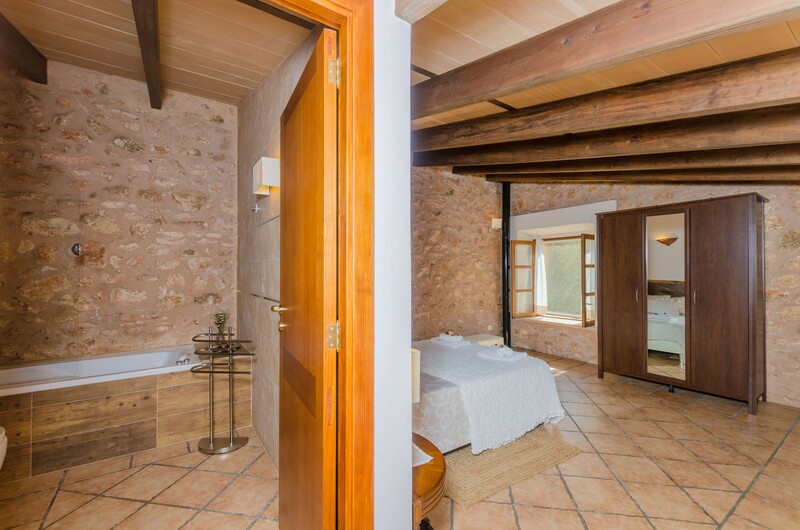 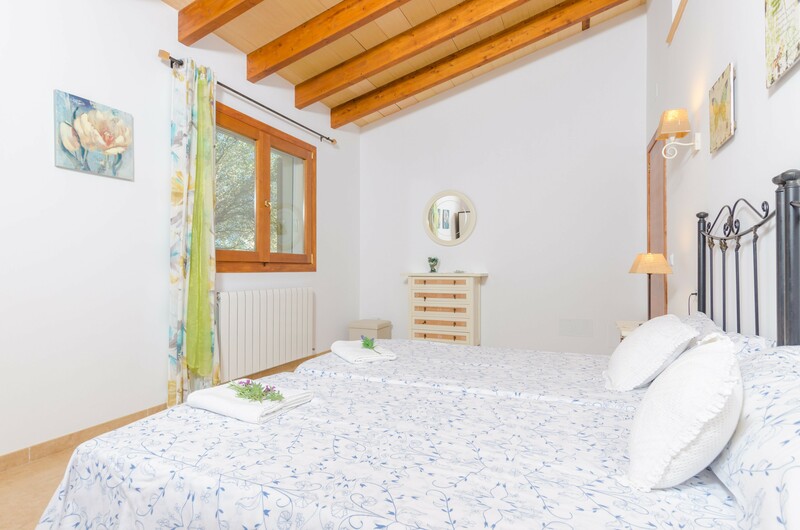 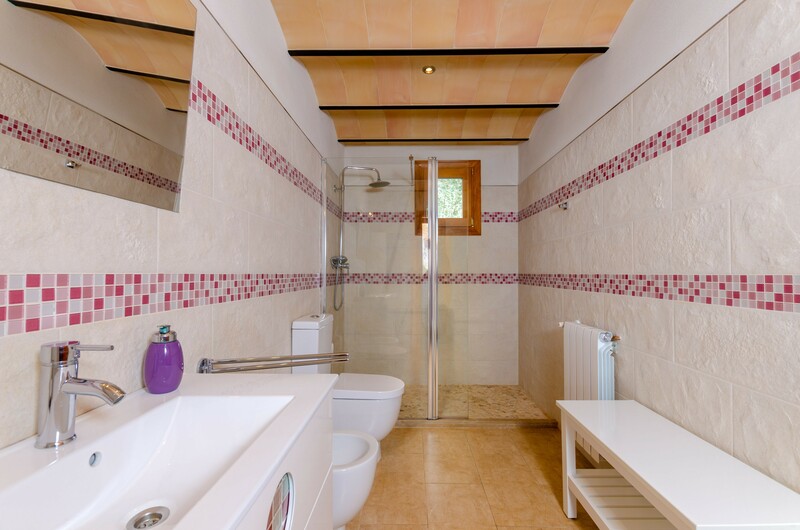 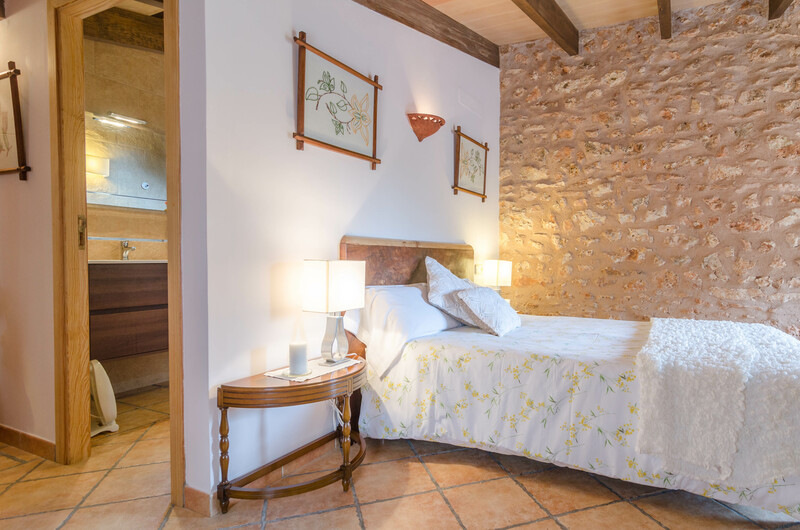 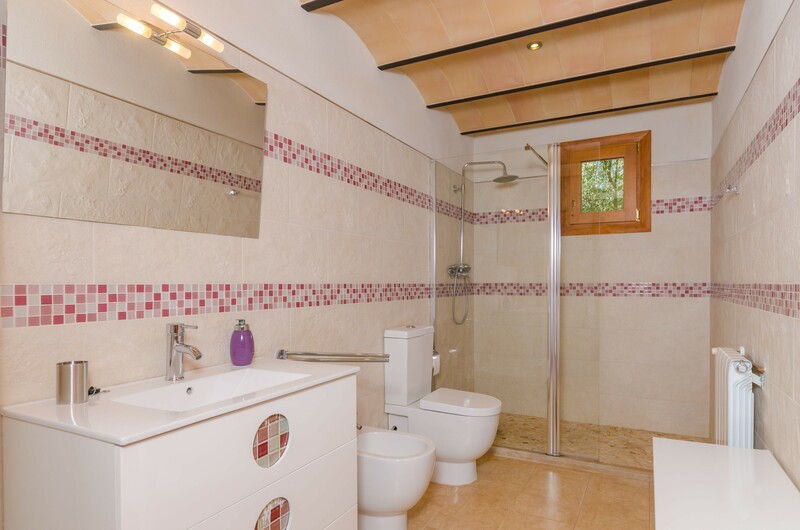 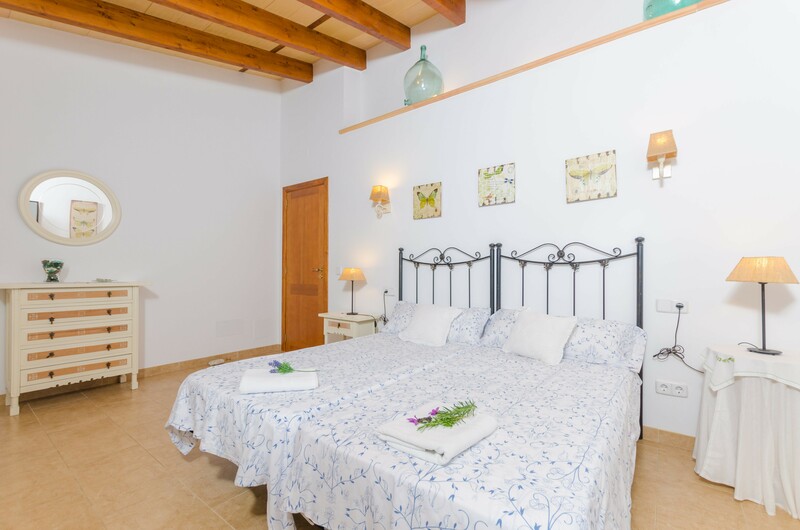 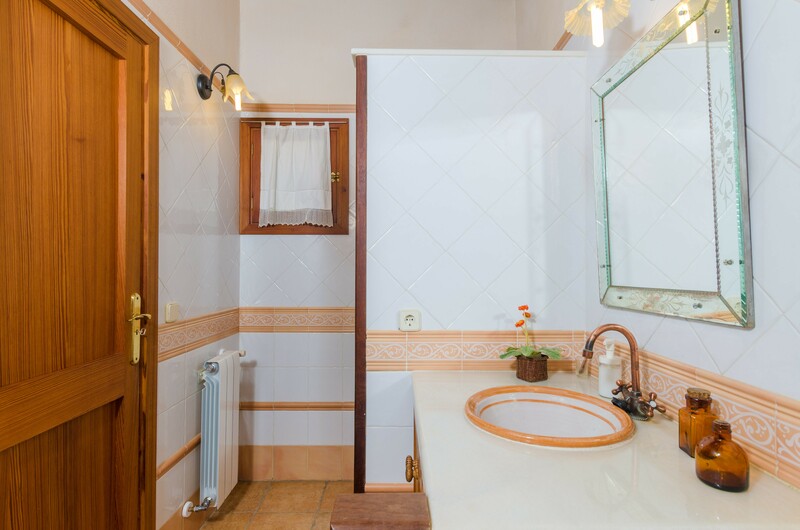 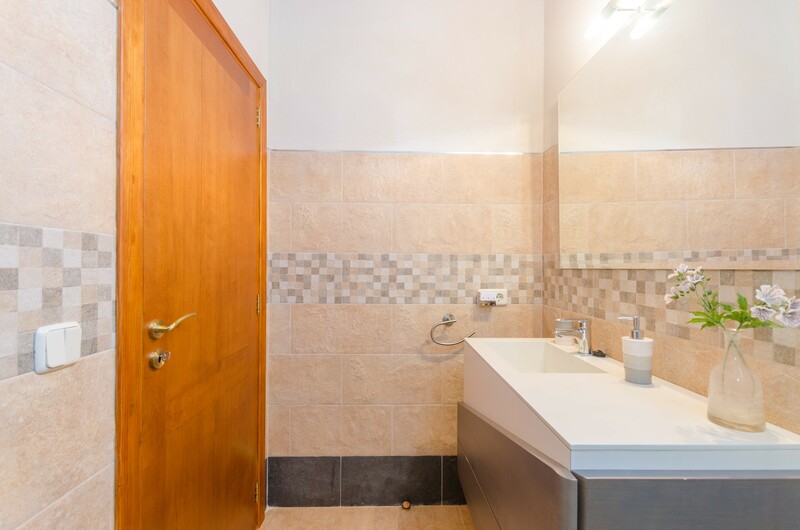 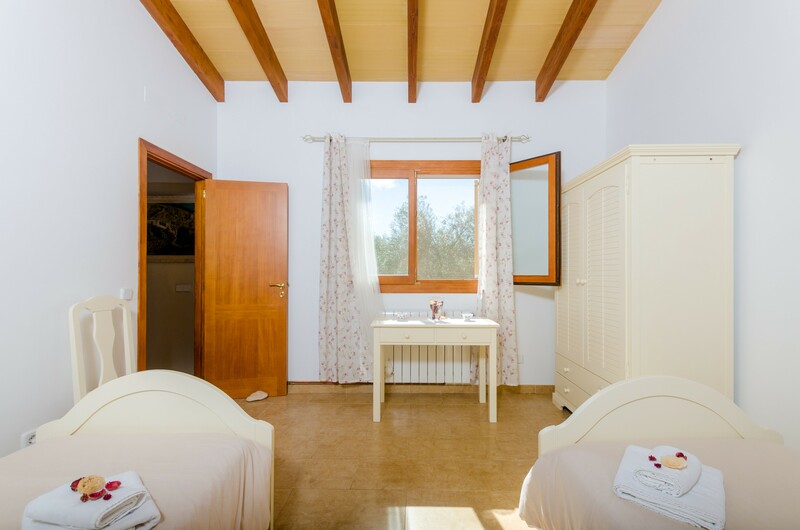 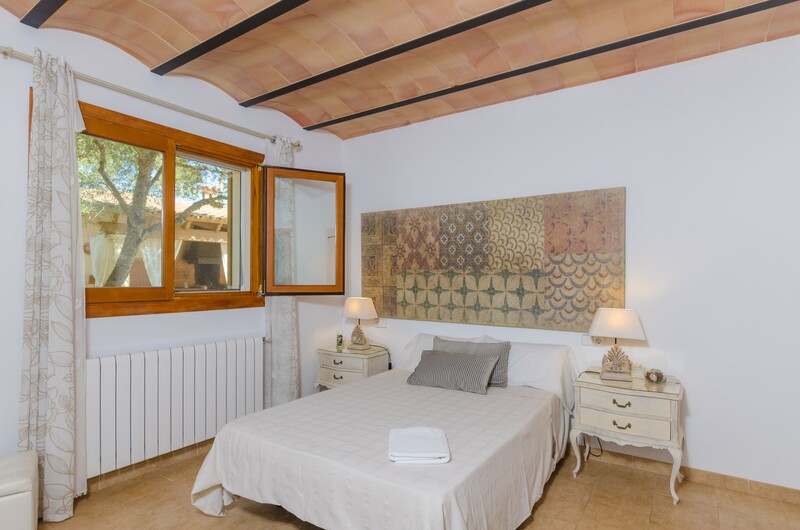 The other three bedrooms, located on the first floor, are equipped as follows: two twin bedrooms and one double bedroom with bathroom en-suite. 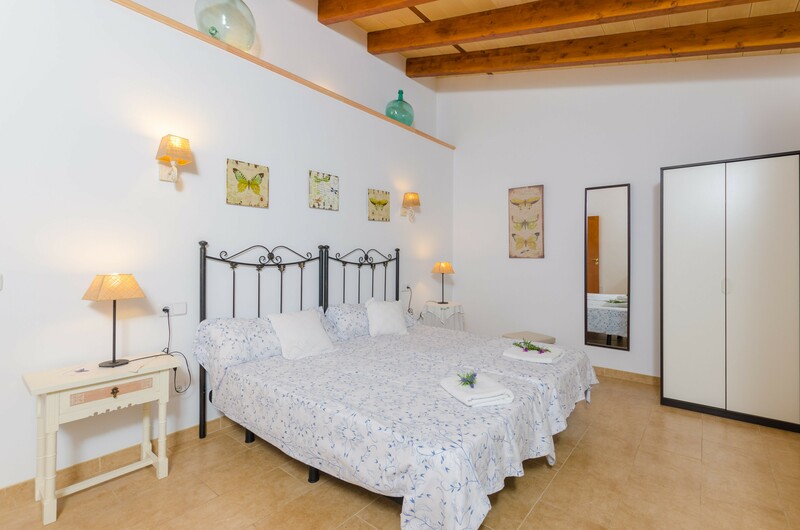 Each bedroom is equipped with a wardrobe and a fan for the summer. 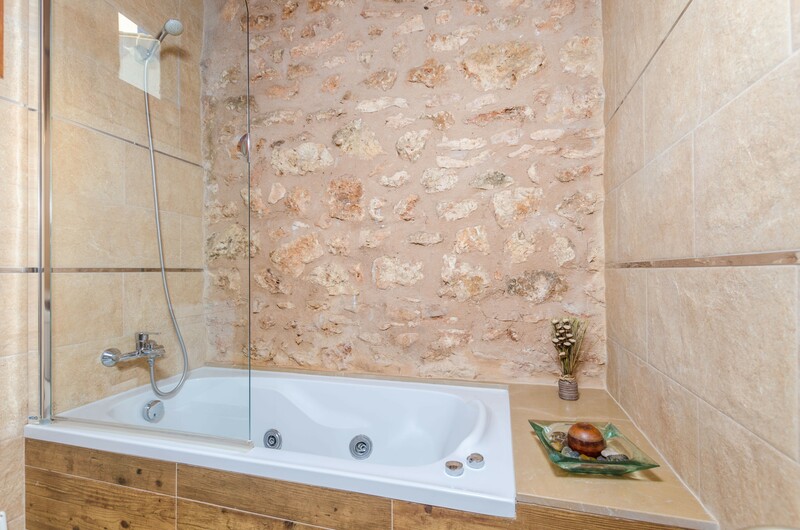 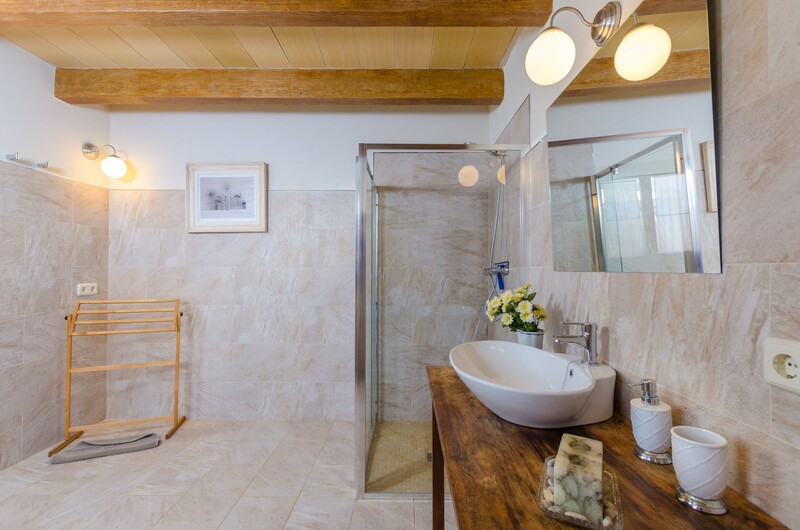 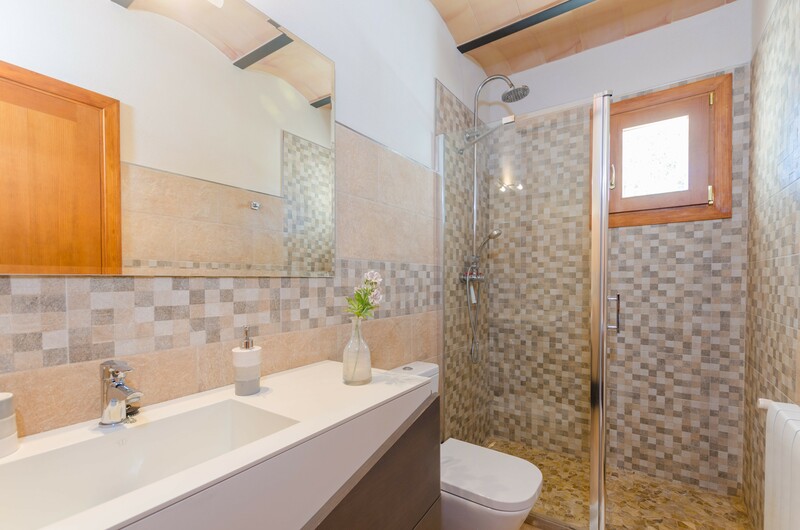 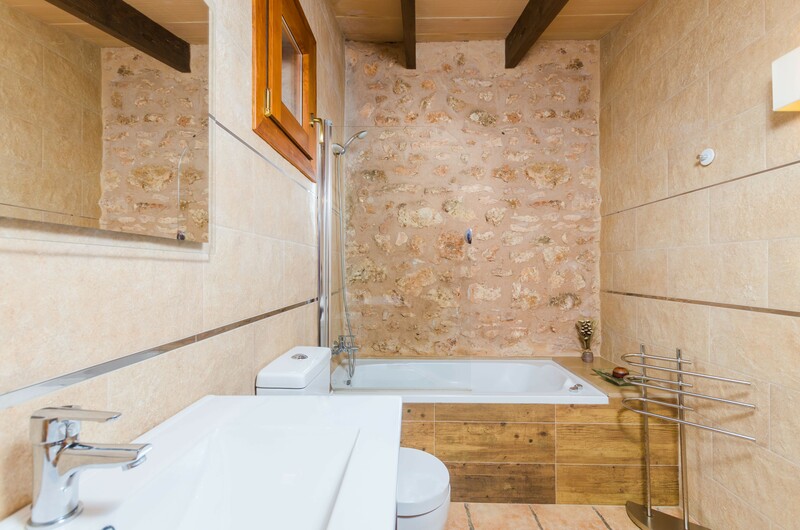 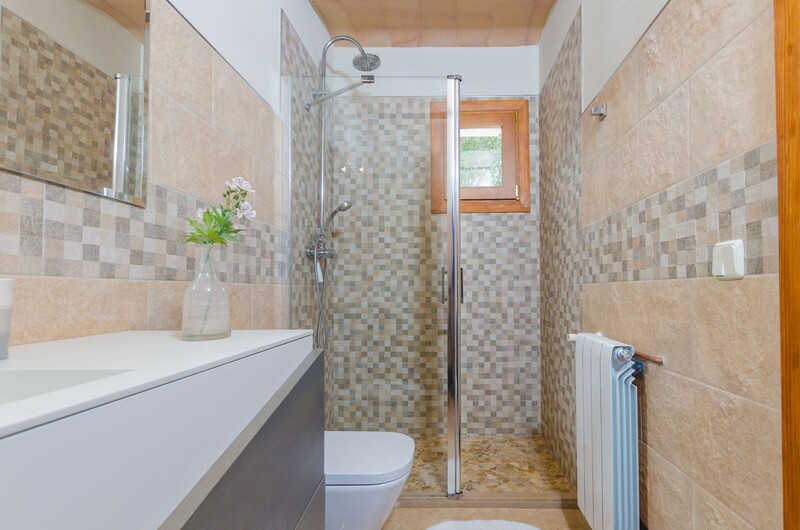 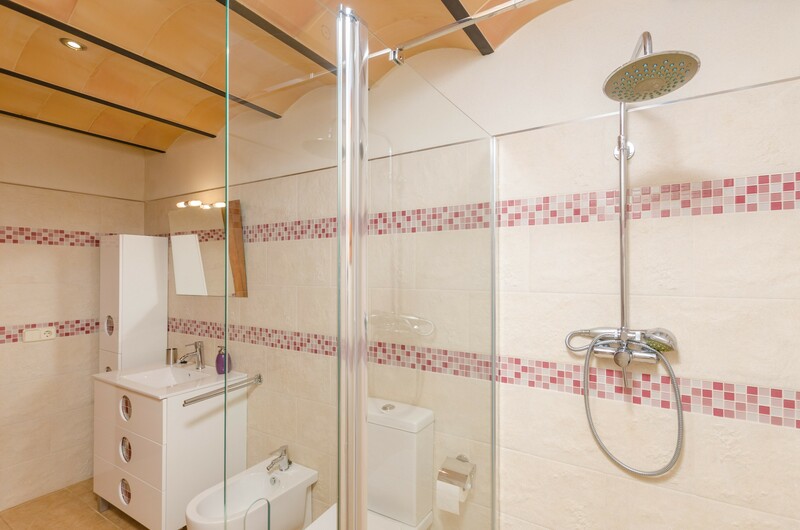 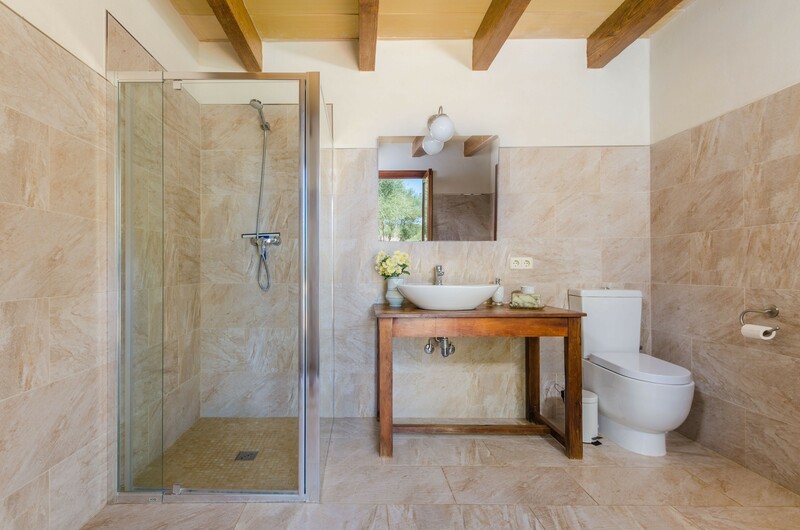 Apart of the bathrooms en-suite, there are two more shower baths on the ground floor and one shower bath on the first floor. 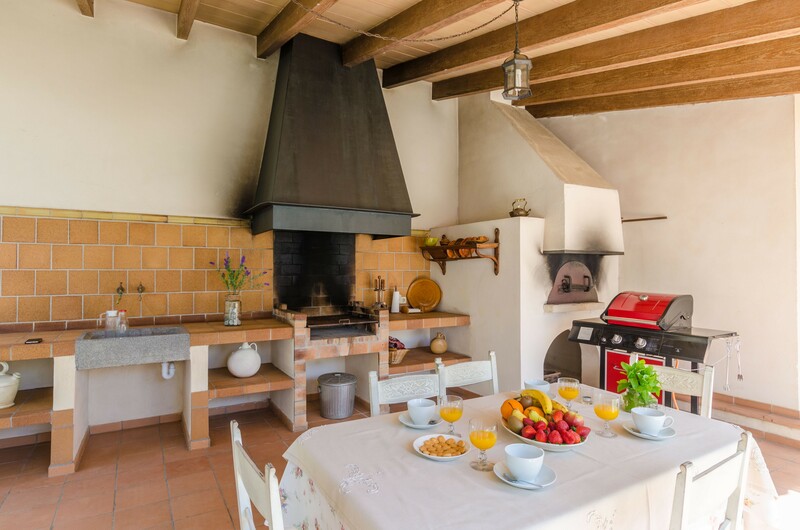 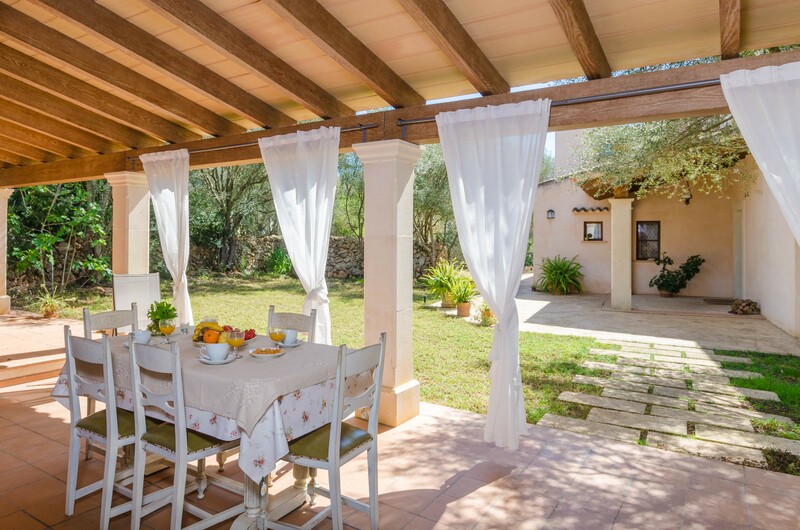 Surrounded by fields, this lovely cottage is just perfect for those seeking relax, far away from mass tourism. 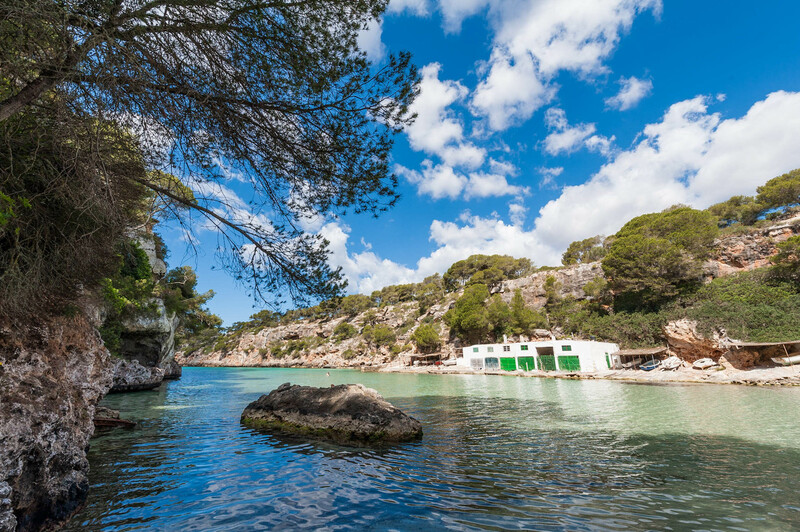 A 20 minutes' drive takes you to Cala Pi, a nice bay which nestles between two rocks. 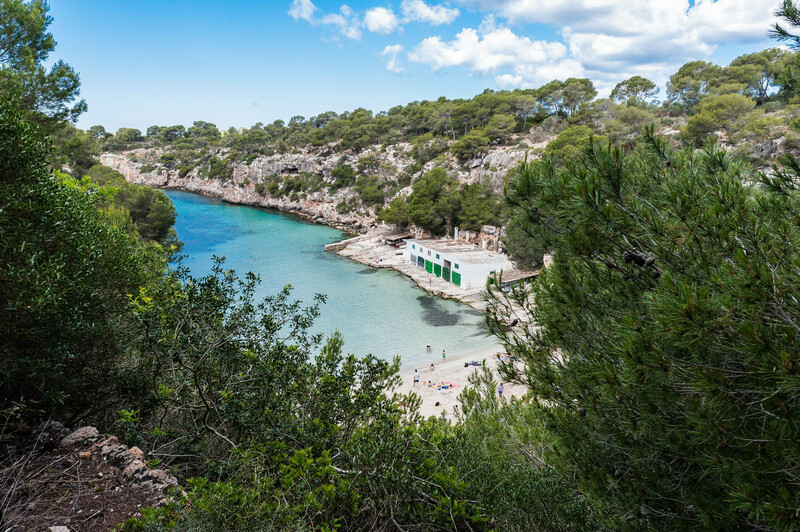 There are many nice beaches spread along the coast; Es Trenc, Sa Rapita and Ses Covetes. 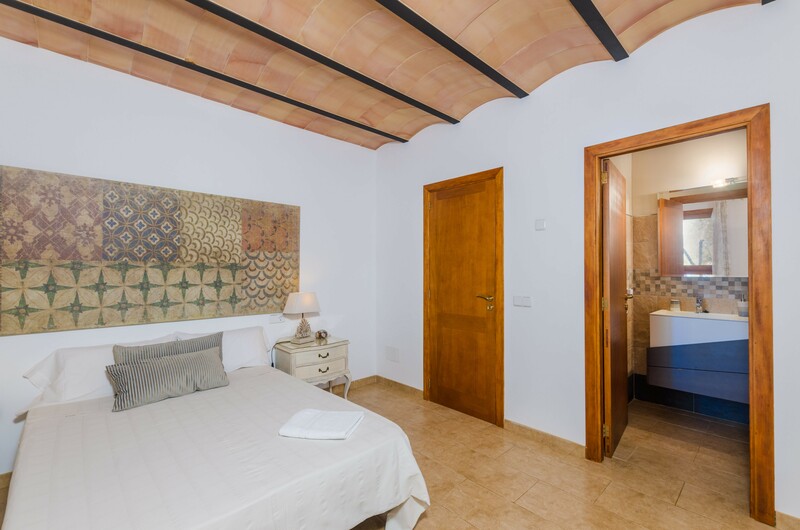 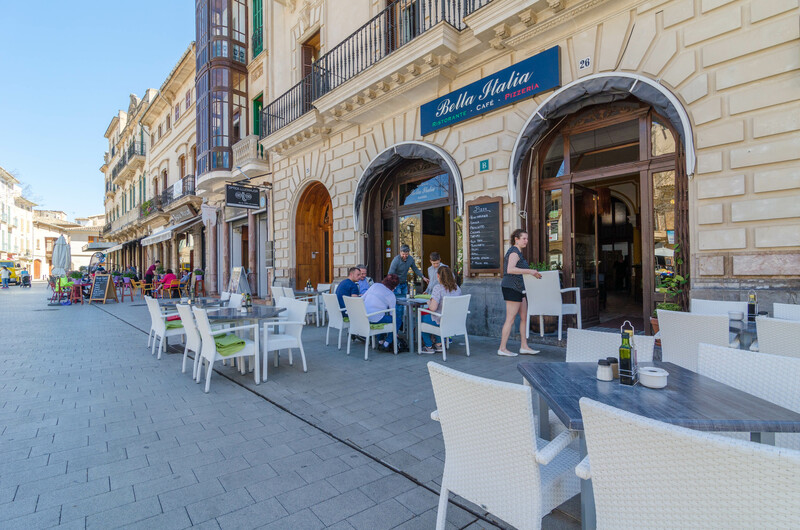 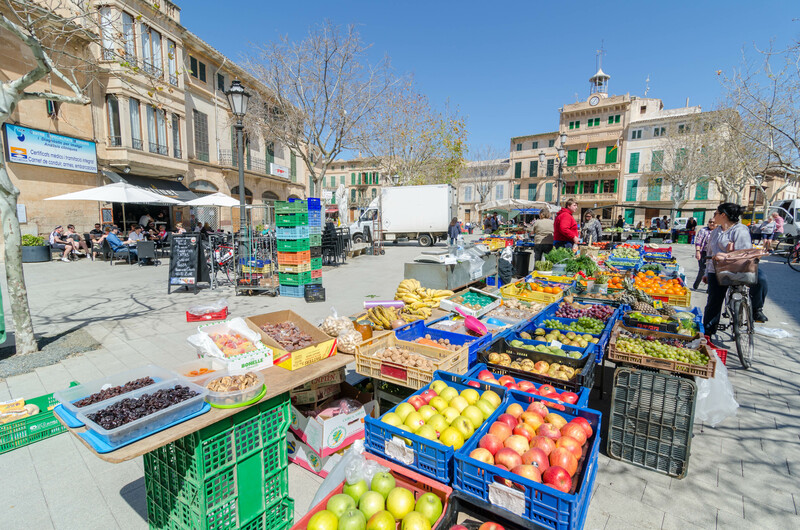 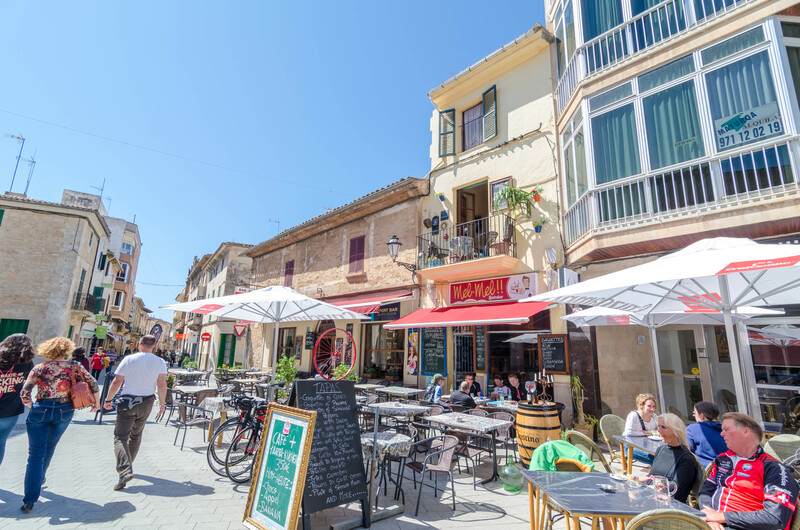 In Campos and Llucmajor you will find all necessary amenities for your stay, supermarkets, restaurants and much more. 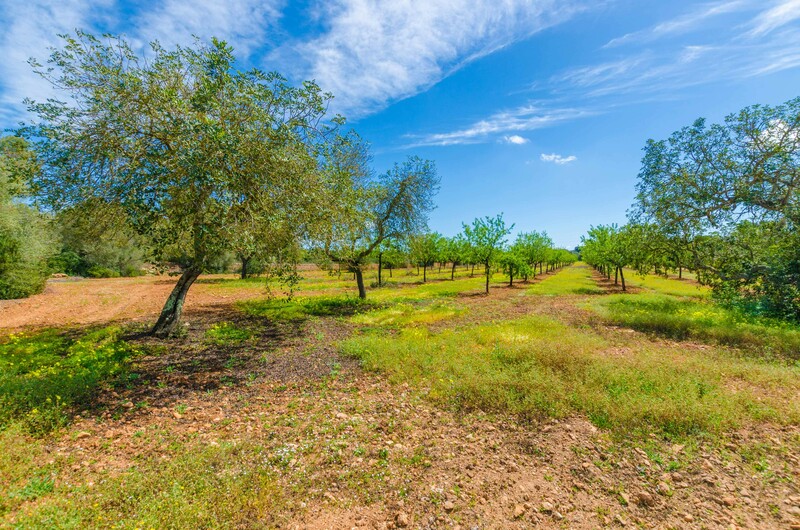 In Llucmajor you can visit the Talayot de Capocorb, remains of a prehistoric village. 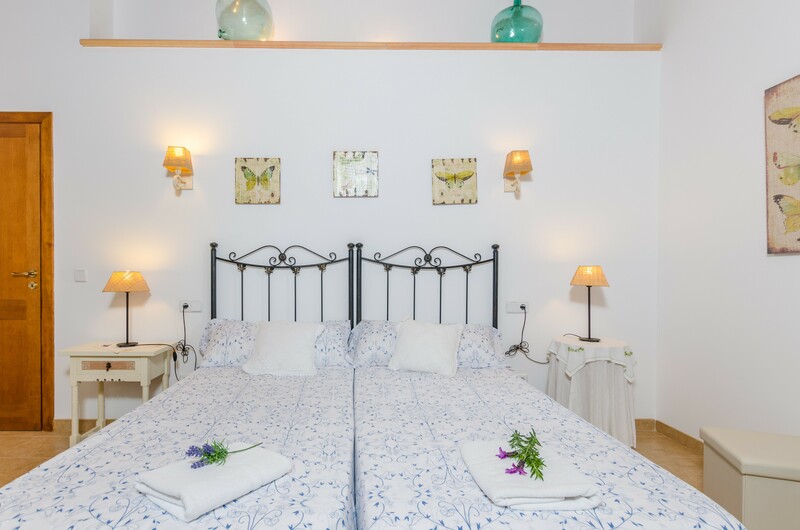 The lighthouse Cap Blanc keeps watching the Mediterranean since 1863 and is a nice place to visit.